In an astonishing news conference on Monday, President Trump, standing next to Vladimir Putin, rejected the overwhelming consensus among U.S. intelligence agencies that Russia interfered in the 2016 presidential election. The remarks capped one of the most bewildering performances by an American leader during a joint news conference with a foreign leader. 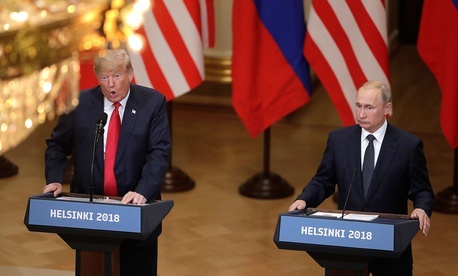 Trump deflected direct questions about Russia's role in the 2016 elections, instead boasting about the margin of his election victory over Hillary Clinton, the Democratic presidential nominee whom polls favored to win; reiterating his claim that the investigation by Special Counsel Robert Mueller into Russia’s actions and possible collusion between Trump’s presidential campaign and Russia was a “witch hunt” directed at him; and asking why the FBI “never took the [hacked] server” belonging to the Democratic National Committee. Trump’s apparent willingness to take Putin’s word on Russia’s alleged interference coincides with a decline in U.S. relations with its closest allies around the world. Trump has criticized Canada, Mexico, and Europe on trade, NATO on defense, the U.K. government on its Brexit plan, and Germany and Sweden on immigration and crime. European capitals, especially, will have watched Monday’s meeting and subsequent news conference closely. Trump’s meeting last week with NATO allies was marked for its rancor. He then called the EU a “foe” on trade, and criticized British Prime Minister Teresa May for her “soft” approach toward Brexit and suggested it may cost her a free-trade deal with the U.S. (He has since reversed himself.) Monday’s meeting with Putin was marked by far friendlier words.